This graph, from the brand new Pocket for Publishers, is a great example. It’s the Pocket activity for “Bitter Pill,” Time magazine’s (incredible, go subscribe and read it) 25,000-word story on the secret costs of healthcare in America, written by Steven Brill. In green, you can see the daily “saves” to Pocket. 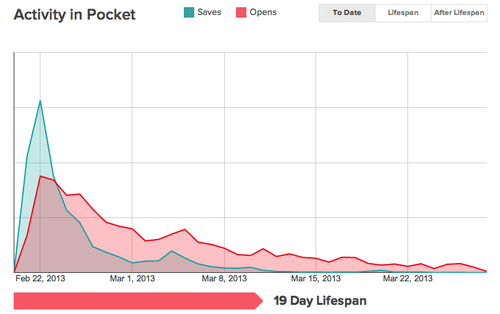 In red, the daily “opens” in Pocket. Three days after the story was published, “opens” overtook “saves,” and this story has gone on to have an open rate of 50% and an active lifespan of 19 days. When readers were given the time to come back to it, they did. I’m excited to be working on Pocket for Publishers (to my publisher friends, go sign up! It’s free), because I think it’s finally answering some important questions about save-for-later. And it’s providing clarity to the sites that are investing in high-quality storytelling that retains its value for weeks, months, and years.